Enjoy your city! RVA Bike Share sets you free to explore Richmond on two wheels. RVA Bike Share is public transportation on your schedule. Grab a bike, go for a ride, give it back. Excited to use Bike Share? Become a Go Pass, Monthly or Annual Member for unlimited rides up to 45 minutes. It’s as easy as (1) walking up to the bike you want, (2) holding your pass up to the handlebars or using the app to unlock, and (3) going for a ride! Walk to a station, choose your bike, and unlock it with your pass or the RVA Bike Share App. Explore Richmond by bike before returning to any station. Find a station on the Bike Share Map or App. The first 45 minutes of each ride is free, but watch the clock. Rides longer than 45 minutes are subject to a $3 per 30 minute extended use charge. Return the bike to any RVA Bike Share station. Push the front wheel firmly into an empty dock and wait for the beep and on-screen notification to confirm a successful return. - Or contact us at 1-877-782-2453 (RVA-BIKE) to create a virtual station and return the bike via the secondary dock. Just safely lock the bike next to the station with the secondary lock and wait for the beep and on-screen notification to confirm a successful lock. A ride for everyone. You can pay for RVA Bike Share passes by the year, month or by the trip. Sign up for an Annual Member Pass for $96 ($8/month) and get unlimited rides up to 45 minutes each. Exchanging a bike at a station will reset the 45 minute ride time. RVA Bike Share and Bewegen work in collaboration for all partnerships. Richmond is pleased to introduce RVA Bike Share. 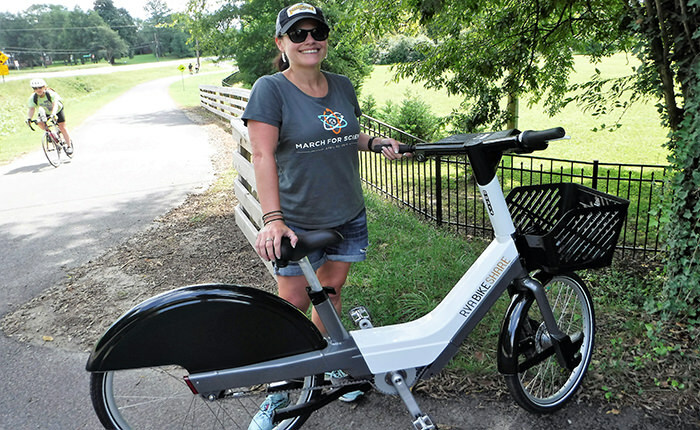 Launched in 2017, the RVA Bike Share system offers bicycles to their users. It’s easy, fun and comfortable. Richmond follows the trend in active transportation by offering a great transit option for residents and visitors to explore the city. RVA Bike Share is available 24/7 and is perfect for errands, commuting, or recreation. Richmond has partnered with Bewegen Technologies to operate the best bike share system available. Going for a ride is simple – with a network of 20 stations and 220 bikes, riders can register for an Annual, Monthly and Go Pass on the website (Go Pass also available on the app), or for a One Way Trip, Day Pass and Weekly Pass at a station kiosk and start riding within minutes. Try one out today! Want to know how Bike Share is helping Richmond? Check out how we’re doing. Everyone is invited to use our data to analyze and study the positive impacts Bike Share is having on Richmond. Together, we can improve the vibrancy, connectivity, and livability across Richmond!